Are you excited to collect candy when Halloween finally arrives? Trick or treating is one of the biggest past times for this spooky night and whether you’re behind the wheel of your car heading to a scary celebration or hitting the sidewalks to fill up your loot bag, you need to know how to do it safely. Toyota of Clermont is here with 6 tips to keep you and your little monsters safe on All Hallow’s Eve! Tip #1: Make sure you’re visible. Make sure drivers, motorcyclists, and bicyclists can see you and your little ghouls and ghosts! Visibility goes way down when it’s dark out, so ensure your costumes all have something light-colored incorporated into them or simply stick some reflective tape on them so drivers and riders can easily spot you and avoid a collision. Tip #2: Teach your kids traffic rules. Make sure you teach your little monsters the ins and outs of traffic. They should always cross at crosswalks, look both ways before crossing, stay on the sidewalks, and not run in between cars. Also, ensure that they know they should never depend on a driver to stop and should err on the side of caution when crossing roads. Tip #3: Only trick or treat in a well-lit area. Remember how we said visibility is important? It’s a good idea to choose a well-lit neighborhood as your trick or treating destination. Streetlights make everything a lot more visible, including your candy collectors, so your chances of an accident go way down. Plus, it’s just safer overall to choose a well-lit spot. Tip #4: Turn on your headlights. If there was ever a night to employ safe driving practices, Halloween would be it. Make sure your headlights are in working order (our Clermont auto service center can give you a hand if not) and turn them on as soon as dusk falls. 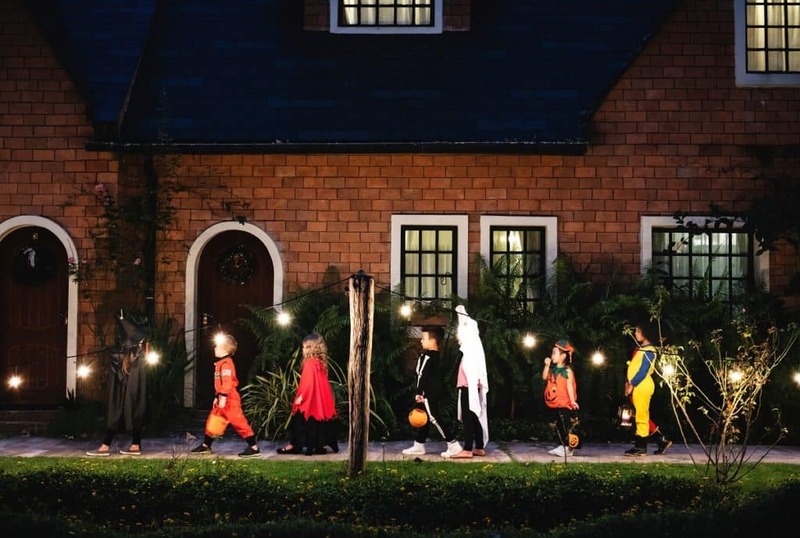 Dim lighting makes it difficult for you to see trick or treaters and other pedestrians who are going to be flooding the sidewalks and streets, so give yourself the best visibility possible, especially in suburban and urban areas. Tip #5: Stop engaging in distracted driving. Put away your phone, stop messing with the radio to find that monstrous music, and keep your eyes on the road and your hand on the wheel. Foot traffic is exceptionally high on Halloween night as people trick or treat and go to parties and other spooky celebrations. You need to have your full attention on safe driving so you can avoid pedestrians. Tip #6: Follow traffic rules. Follow the rules of the road! Go the speed limit, use your turn signals to indicate where you’re headed, and come to a full stop at stop signs and red lights where you’re turning right. You’ll want to double check that crosswalks are completely clear before pulling through them and be sure to keep your eyes peeled for any little monsters who may suddenly dart into your path. Have questions about safe driving? Call Toyota of Clermont today. We can also get your headlights on track for All Hallow’s Eve at our Clermont auto service center! We’re open until 10 pm at (352) 404-7000.